Hey guys and welcome back to my blog!! Today I’m sharing how I transitioned to farmhouse style and a few tips if you’re looking to do the same. You see, I haven’t always been a decorating ninja. Well, that’s probably up for debate, but I think it’s safe to say I’m a whole lot better than I used to be. And you’ll soon see why because I’m sharing photos of our previous home, how I decorated, and how I would change the space today with farmhouse style in mind. 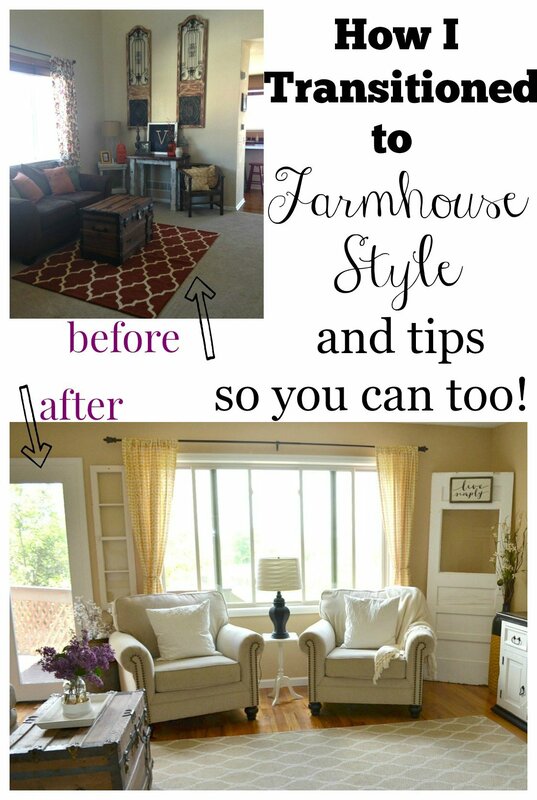 I hope this post will be useful for those of you that would like to transition to farmhouse style in your own home, but not sure how to do it. It doesn’t have to break the bank, it’s just a few simple changes that make a big difference. Let’s start by dissecting the before photos of our old home. We lived in a track hosme in your typical suburban neighborhood–every house on the block looked basically the same. Truth be told I really liked our house, but I seriously struggled with figuring out how to decorate since the house had little charm on its own. I apologize in advance for these old grainy iPhone photos. I feel like we should have a moment of silence for this hot mess…..
As you can see, there are a variety of issues going on here. I clearly had a love of vintage and antiques and you probably recognize a lot of the same pieces I have in our home today–like my Granny’s old trunk, the old books, and the old screen window on the wall. But there’s a loooooot of distractions. So let’s break it down down and talk about how I would do it differently today with farmhouse style in mind. The biggest thing that sticks out to me about these before photos is the in-your-face use of bright colors. Honestly, at the time I really liked this about our home. I thought it was fun to mix as many colors as I could. And while that’s definitely a happy way to decorate, it’s not the most soothing or peaceful. This just looks busy and kind of stressful, right? Bright orange rug. Dark orange and green pillows. Lime green picture frames. Turquoise table. And those crazy curtains. It’s just too much. And not even close to farmhouse style. Farmhouse Style Tip: Step away from the brightly colored things. Today I go for whites, creams, and grays in basically everything I put in our home: throw pillows, rugs, curtains, even the painted furniture. In our home now I do have an occasional pop of yellow, but it’s not overbearing. That simple switch makes a BIG difference. 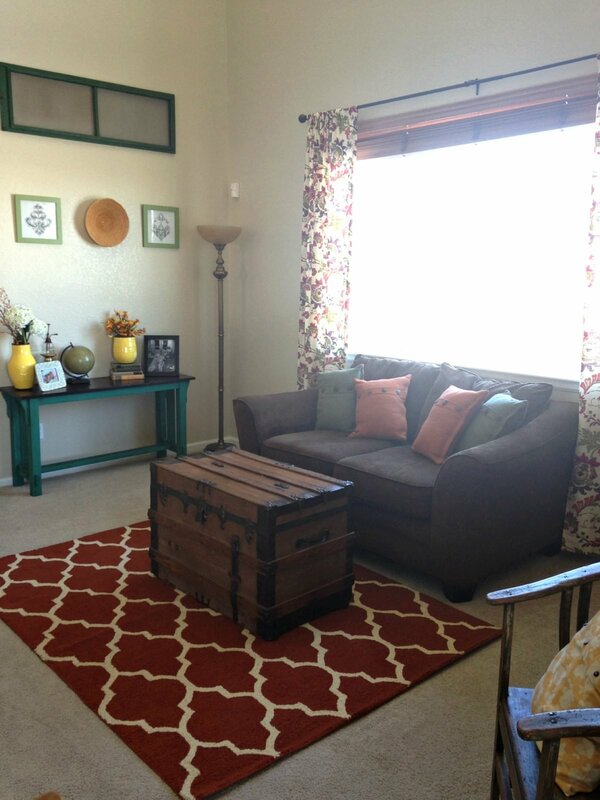 Area rug purchased from Target–similar one here. 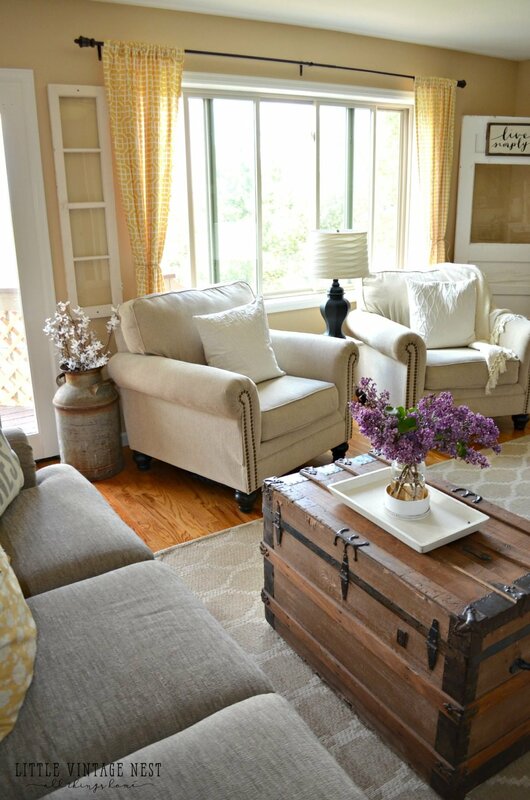 Choosing the right couch is important if you’re going for a cozy, farmhouse vibe in your home. If you’re browsing through Pinterest or Instagram for farmhouse decor ideas, you’ll see a lot of white or cream colored couches and chairs layered up with lots of pillows and blankets. Sometimes you’ll see leather furniture as well, but I don’t notice it as often. The little brown couch in the old living room is not something I would purchase today, I’d definitely opt for a light tan or cream color instead. But if you have one like this in your home it’s definitely possible to make it work. What I’d do today: Today I’d search for a light colored slipcover to use on this couch. If I couldn’t find one I’d reach for lots of white throw pillows to brighten it up. You can also drape a white blankets over the couch and you’ll have a similar effect as the slipcover. You can see in the before photos that I was on the cusp of creating a farmhouse style living room, but I hadn’t fully committed to it yet. I have a few small vintage goodies here and there, but this room definitely needed a lot more to embody that farmhouse feel, which is all about galvanized metal, antiques and vintage charm. What I’d do today: I would rely on antique or vintage pieces for the majority of the decorating in this room and only supplement in with modern pieces here and there. 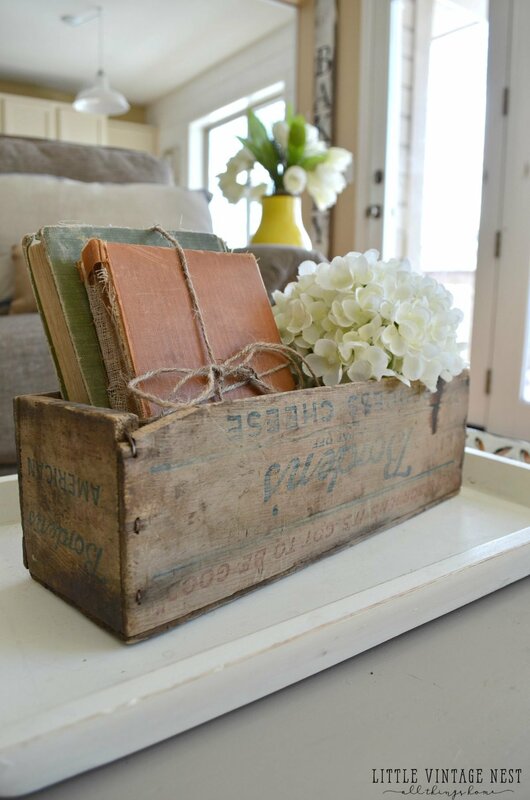 Maybe an old scale, galvanized bucket, or old dresser painted white to replace that sofa table. I have a whole post about how to decorate with vintage decor, so be sure to check that out for more tips. The old living room had zero chippy furniture or accent pieces. Nada. At the time it wasn’t something I ever reached for. But it’s definitely a big part of farmhouse style. And today I cannot stop myself from decorating with chippy things. What I’d do today: I’d hang a huge old, chippy window on the wall and maybe add few chippy spindles with a pile of old books on the trunk. Or an old door in the corner. Yes, definitely an old door. Just a few of these pieces will make a big statement. 5. Shiplap. Just do it. I was also so intimidated by the idea of doing shiplap in our old home. I loved the look, but I never thought we could pull it off. Just think how great the old living room would have looked with shiplap, even just an accent wall. 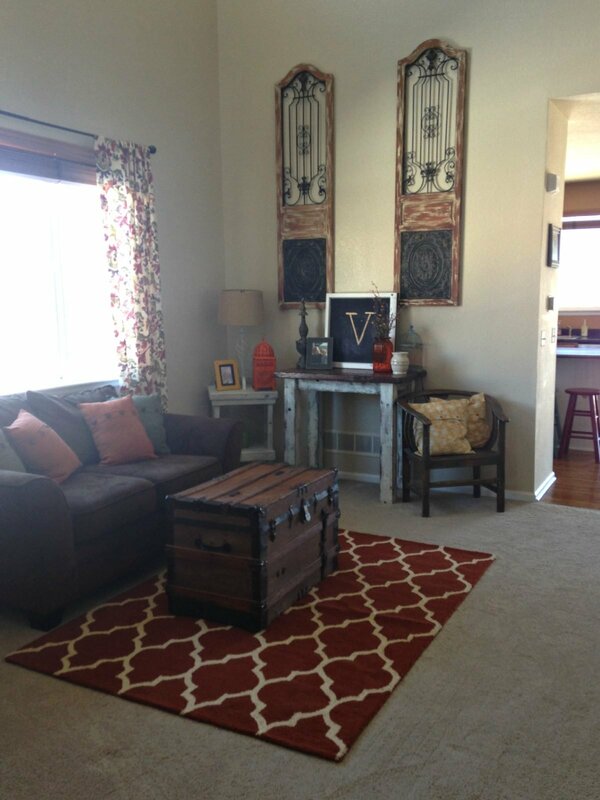 It would have completely changed the feel of the room and brought instant farmhouse charm to a track home. And it’s CHEAP. What I’d do today: If we still lived in that home I would have done a shiplap accent wall around that big window. It probably would have taken a full day of work, but the payoff would have been totally worth it. 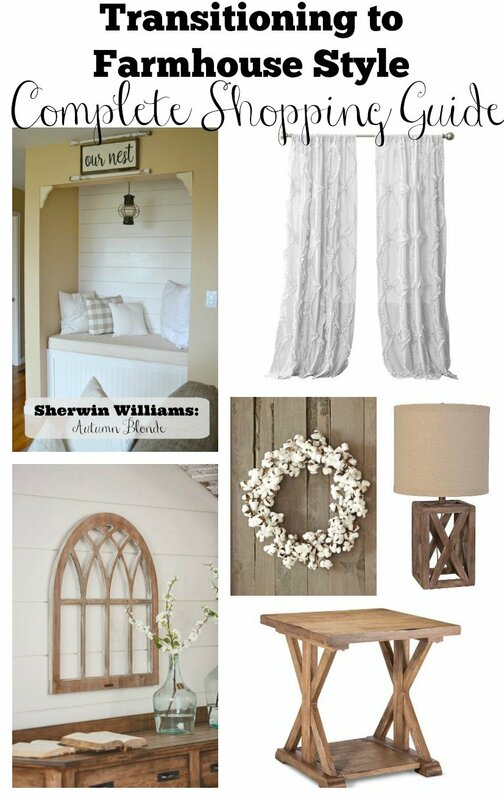 I have a full tutorial on how to get the shiplap look here. So there you have it. 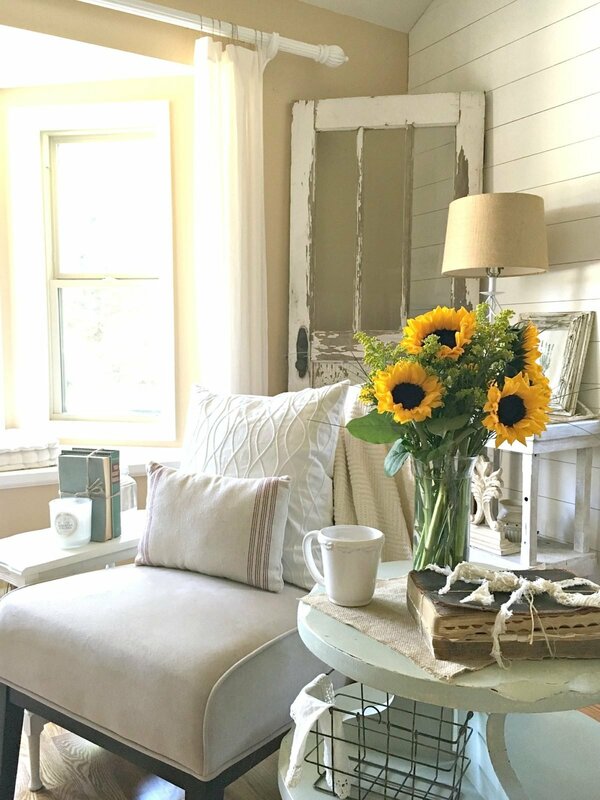 A few simple tips and ideas to transition to farmhouse style decor and what I would do today if we still lived in that home. It’s definitely been a process over last year, but I feel like I’ve finally found my style. And it’s definitely apparent after comparing the photos of our old home to the way I decorate now. While I still love bright, happy colors, I realize using them to decorate is really tricky and mixing too many colors can quickly result in a busy, stressed out room if not done properly. Farmhouse style is all about coziness, soft colors, texture, and vintage goodness. I hope this post shows you it’s completely attainable with a few simple decisions and changes in your home. Thanks so much for stopping by! I’d love to chat in the comments below or find me on Facebook, Instragram, and Pinterest. Your home now is just my cup of tea. I just found your blog recently and have been having fun watching you decorate. Thanks Bredna! I’m so happy you’re here and following along! Hello..we recently purchased a German farmhouse and I am looking forward to using some of your farmhouse/vintage decor ideas. Thanks for the pics! Thank you for this post! I’m decorating my first home, this is definitely helpful. I love following you on Instagram! How exciting, Haley! I’m so happy this was helpful for you. Good luck decorating your new home! Thank you Courtney! What a sweet and kind thing to say. Thanks for being here! Sarah! This is great!!! I really love how not only do you have awesome photos, but your writing is so organized and easy to read and follow. I’m learning so much from you. Well I try to make it easy! Thanks for your support my friend! Thanks Karla, I’m so happy you’re here! Your new style is so welcoming – not that there was anything wrong with your old style! I live in a tiny beach cottage so I don’t do farmhouse, but a lot of your ideas work with my “shabby coastal cottage” style. I pinned several pics for reference. Thank you so much Carol! I would love to see your beach cottage, sounds heavenly! ou on instagram now too! I love your curtains made from painterscloths…just beautiful! Yay! I’m so happy you found me Rondell. Good luck as you transition to farmhouse style! Thank you Jolene! I’m so glad this was helpful for you. Good luck with your move and new home! And thank you for subscribing, I really appreciate it! Thank you for making it seem like a possibility rather than a nightmare. Wow, I love it! What a great job!! Would you like to come to NY and help me out:)) Would you tell me about your dining table, did you repaint it? I would love do use the same colors for mine. Thanks a ton! What is the pretty light yellow paint you used? I love your home! 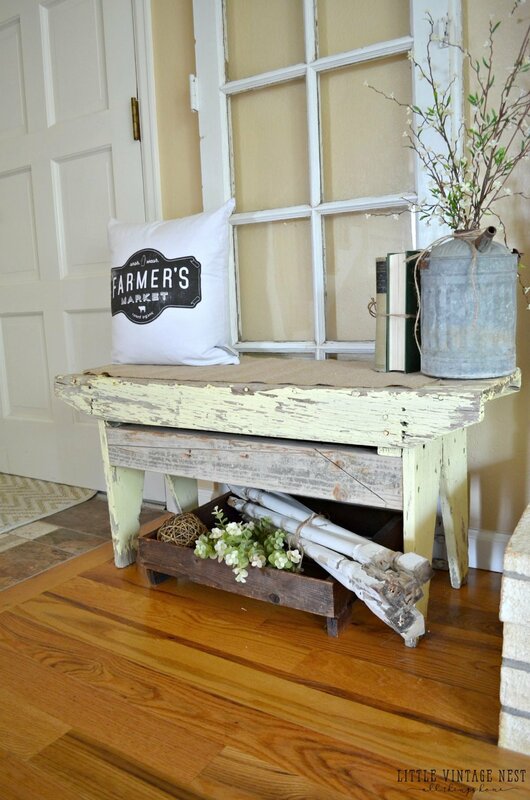 Currently, I am a little farmhouse style with a lot of primitive mixed in. Unfortunately, I have a dark sectional sofa that my husband refuses to part with, so I’m trying to make it work. I am thankful that transitioning from primitive style to farmhouse will be fairly easy since our home is filled with chippy wood, antique cutting boards and a lot of old signs. I hope once I have it all farmhouse style that it will be as beautiful as your home. Aww thanks so much Tammy! 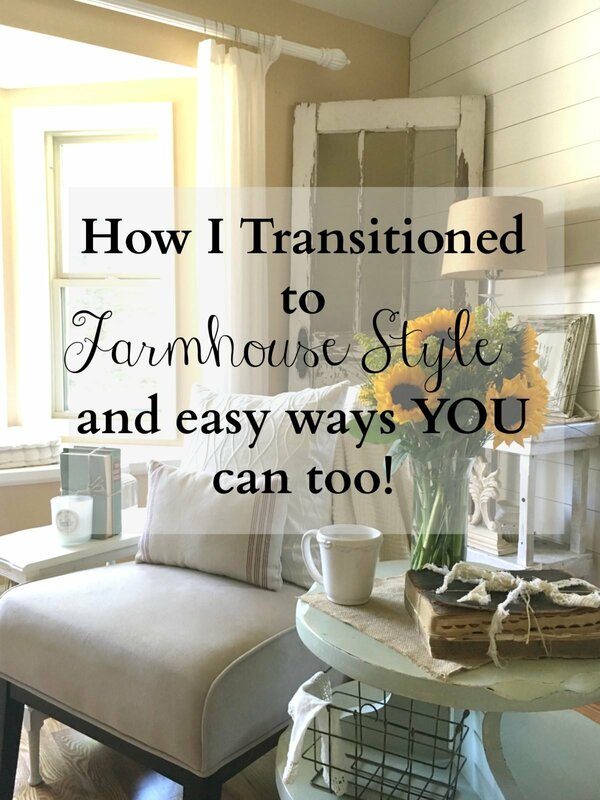 I agree, it sounds a transition to farmhouse style would be easy to accomplish in your home. Good luck and thanks so much for stopping by! Love your house! Where did you find your light hanging over your table? Thanks Kathy! We actually found that pendant at an auction and we turned it into a light fixture. Hi Doreen! I found those at American Furniture Warehouse, http://www.afwonline.com. I’ve had them about a year, but I think they still carry this chair. Thanks for being here, I appreciate it! collecting farmhouse for years, and that is my true self. Now I’m excited to put it to use, I love ALL that you did. Thanks for the photos! I’m kind of in the same boat as you used to be…really loved this type of farmhouse/vintage style for a while, but when I got married and couldn’t really find what I wanted to decorate with (and at the time didn’t really think about DIY), I ended up buying a bunch of furniture I didn’t love, but seemed okay at the time. This post was the inspiration for me finally making the transition to making every room one I adore. I ended up painting my dining table white (which I had bought brand new just a few years ago) in July and painting and reupholstering the chairs because of your blog posts and I love love love how it turned out and have gotten so many compliments! Thanks for making DIY seem doable. Now I’m ready to tackle the living room, which is so dark, full of brown furniture and a crazy kaleidoscope rug. I’m looking forward to lightening it up. Do you have any suggestions for slipcover shopping? I wish I could sew, but don’t even own a sewing machine (yet)! Hi Hillary! I’m glad you stopped by. Sounds like we both have similar experiences with decorating–I too used to buy a lot of furniture I wasn’t crazy about but figured it would work. Sounds like your dining table looks great, I’d love to see it! And as far as slipcover shopping goes…Slipcovers for couches can be hard. I actually just used a large white quilt on our couch in the basement and it worked well to cover it up. You can check out Etsy, I know there are some options on there. Good luck! Your home is so beautiful and inviting. Over the last 20 years my home has transitioned from country, to a rustic cabin theme, and now I’m attempting to transition to a farmhouse inspired style. I’m attempting to incorporate new and old pieces to create the home I envision in my mind. Any tips as to how to transform a kitchen with brown cabinets to a farmhouse style without painting the cabinets. With light brown cabinets, dark hardwoods, and brown/gray granite counter tops this has been a frustrating effort. The kitchen & living room are open concept; white 2 panel slated interior doors, waynes coating, wide white trim throughout, & white fireplace. I’m in need of some tips as to how to give it the farmhouse feel I so love. Thanks for all your inspiration and tips! It sounds like you have a beautiful home Jenni! Painting your kitchen cabinets might be the best route to go if you want to get a brighter look in that space, but you could also consider leaving them brown and just putting glass each each cabinet door, which would take a lot of that darkness out. Or you could even look at taking some sections of the cabinets down to do open shelving, which I’ve heard is actually very easy to do. That would also add some character to the space. Good luck to you and thanks for stopping by! Hi Sara, I love your blog, thanks for sharing. I love farmhouse style as well. My issue is my home is filled with oak (which I don’t want to change). I also have many antiques in medium to dark oak. Is it possible to keep the lovely wood tones but still achieve a farmhouse feel? My baseboards and fireplace are white and interior walls are a cream color. Help! love your house! it is so cute!! i’ll be busy changing things today!! Aw thank you so much Lori! Curious if you still have the black curtain rod or the white on pictured? I kinda like the black on and was wondering where to find a slim black on like that? Thanks! I love your blog! I do still have it and I believe it was purchased from World Market, they have a great selection of curtain rods! Hi Sarah, love your blog…. getting ready to hopefully start my own here. I think what I’ve been stuggling with the most was picking a name… all the ones I’ve wanted are taken. I think I’ve finally settled on something. I wanted to ask you about pictures, I eventually want to take my own pictures for my blog. What’s a good easy to operate camera that won’t break the bank that will help give those bright crisp photos that won break the bank 🙂 thank you! Hi Sara! Congrats on wanting to start your own blog, that’s exciting! I actually use a Nikon D5100 for my blog and I found it on Craigslist. I got a great deal on it and it’s been an awesome camera for me. I definitely recommend it! hi! 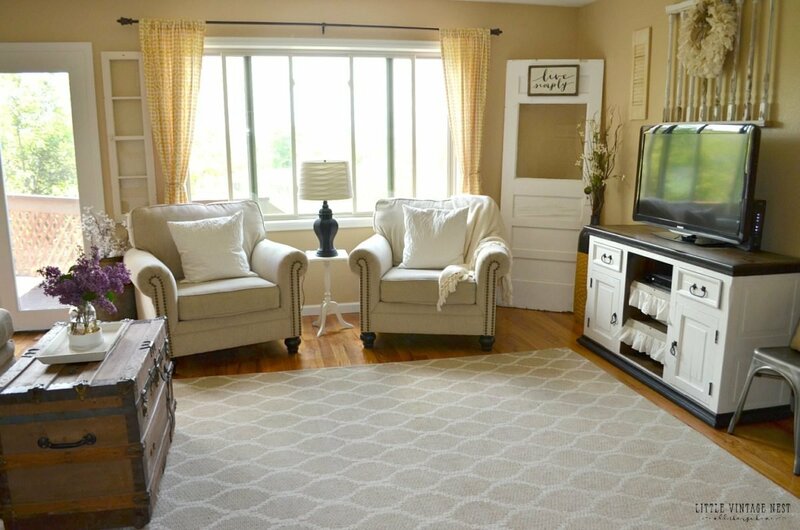 i love the chairs you used in your farmhouse styled living room. can you share where they came from. we are in the middle of doing our 11 year old mismatched living room furniture into something better and brighter. Hi! Just came across your beautiful blog and home. Got so inspired by the pops of yellow in your decor. Looking to incorporate some yellow in my decor as well. Thanks for the tips! 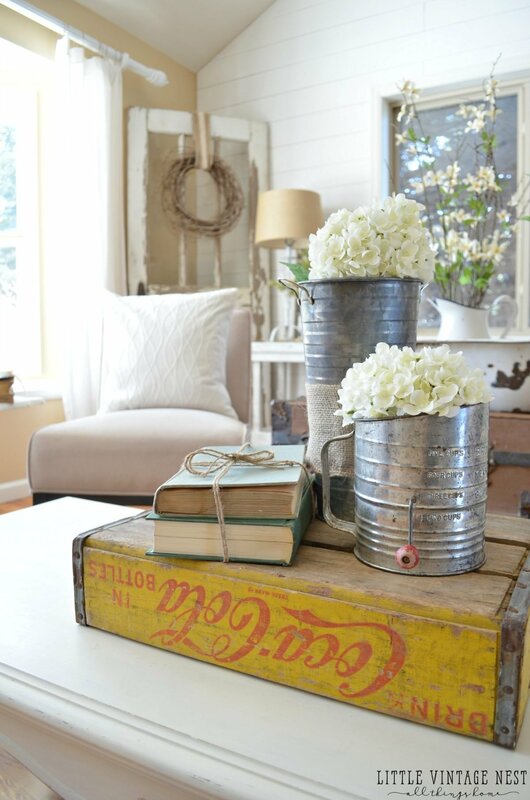 I so ❤️ your blog on how to decorate in the vintage farmhouse style! Lighter colours definitely are what I need in my little house. Thank you for your inspiration! Your white/blue pedestal table has inspired me! We have a very similar one that I’ve been thinking about painting. Do you have a tutorial on that? Hi Heather! Unfortunately I don’t have a tutorial on that little table, I actually bought it painted that color. Good luck with yours! First off I want to say your home is beautiful! I love the crisp, clean airy feel to farmhouse style yet it’s comfortable and looks and feels like a home! I’m just beginning my transition from a dreary primitive style to farmhouse style but haven’t even bought my first piece yet. We are on a tighter budget so most of my finds will be on sale or flea market diy projects. I have been researching and trying to learn more about this new style but your website and blog has been the MOST helpful. Especially the ‘Shop Farmhouse’ section and the one where you explain how to decorate. I need a visual and you have provided so many different photos and options it helps so much to see what really can be made to work with this style. I have a med-darker brown microfiber couch but love the lighter neutral tan/beige colored walls and the pops of blues and yellows. It will be interested trying to piece all of this together with a darker couch since a new couch isn’t in the budget right now. 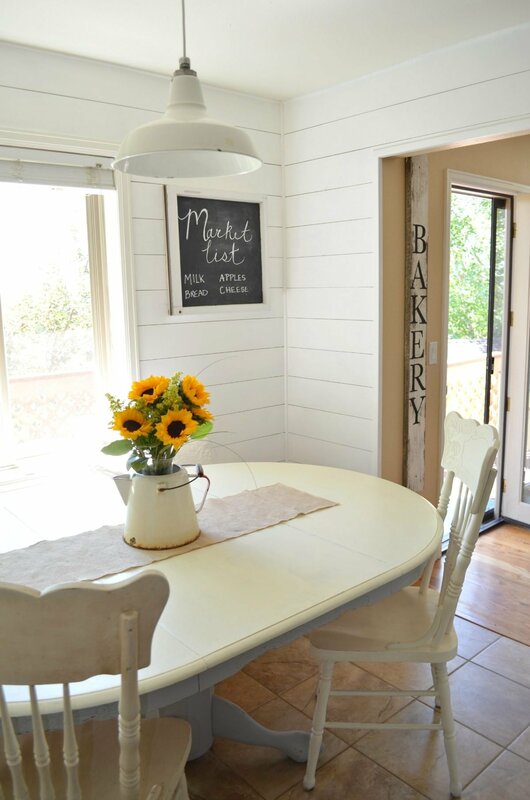 We found a diy tutorial for a farmhouse dining table and bench then plan to sand and do something with our current 4 dining chairs is a nice older set. Anyway, I have ideas lol it will just take time to execute and afford piece by piece but I am so excited to start! So glad I found you! This is the first advise that makes sense to me! This is my perfect guide as I set up our new home in a few wks when we close on it! I’m thinking gray paint, maybe pulling brown.. wish me luck! Thanks again! Karen ???????? May I ask what brand paint and color you used on your living room walls? The home I am redoing has that color hard wood and for some reason I am struggling to find a paint color I like. This one looks so cozy. Hi Patty, this color is Autumn Blonde by Sherwin Williams! I love the look of the living room. Where can I find the two side chairs? They are just what I want in my room. Love love love this blog!!! So glad I found it!! Aw thank you Jeannie, so glad to have you here!! The main issue – our BEDROOM (formally used as a game room) is pretty big… ~8ft H × ~14ft W × ~24ft L. We also have a full bath with a double vanity & a decent sized walk in closet. Anyone would love to have a bedroom like this, but I am HATING it right now… maybe I should say “stressing” it more. Different colored everything, from light bedding, brown leather couch/chair/ottoman, a light/medium oak electric fireplace under a mounted TV, medium colored wood desk, small & plain black end tables and TWO, very LARGE dark, dark, DARK pieces of furniture (dresser with matching/mounted mirror & armoire – total VAMPIRE VIBE to me and not relaxing in any way). My fiancé got it free (which is always nice) from a client – he’s a foreman for a construction company – but he said he may be able to get the matching end tables & headboard/base for the bed. My excitement for our bedroom to become quiet, peaceful & relaxing has completely diminished. I don’t know how to rearrange anything in here anymore (& I would change it every few months!) and I need, desperately, some advice for how to lighten this furniture the best way & possibly how to convince my fiancé we should do it in the first place. If I can send you pictures of my bedroom, if you are willing & able to take a look – because I’m almost 100% positive – you could tell me EXACTLY what I can do …I do have some ideas in mind, but it just needs to get done ➡”Stay At Home Mom” right here⬅ with my 2yo daughter & my fiancés 8yo daughter & 7yo son – I need a comfortable getaway! Hahaha! Let me know if you can help me in any way! I’d so much appreciate it! Thanks for your time, Sarah & keep doing what you’re doing because we are ALL loving it &, especially, YOU! Just signed up today! I have an old Cottage built 1840….original sash windows etc…so lots of character, but I have had difficulty in deciding how best to decorate it……until now!….love your taste and your very helpful hints and tips…can’t wait to get started!!! Just simply lovely! Great choices and I really love everything you have done! I just signed up recently and I look forward to more wonderful ideas and projects. Oh yay!! Thank you for signing up Char! I just moved into a Tuscan-style house. I’ve always decorated very traditionally with darker colors as my previous house was huge with cream tile, cream walls & very tall ceilings. Now it all feels cluttered, closed in & dark. Your blog is giving me lots of ideas. Very cute!